Watching the dolphin attraction in the sea directly can be an unforgettable exciting experience for you and your family while on vacation in Bali. You can see cute dolphins directly in Lovina Beach, Buleleng regency. For a long time, dolphins became one of the interesting tourist attractions on Lovina beach. If you want to know more about Dolphin tourism attractions on Lovina beach, please read the complete information below! If you are from out of town and by air, you will arrive at Ngurah Rai International Airport, Bali. Upon arrival at the airport, you can go directly to the location of Lovina Beach to witness how charming Dolphin attractions are in the wild that you can see directly. The location of Lovina Beach is on Jalan Lovina Beach, Anturan, Buleleng, Bali. The distance is around 86 kilometers in the Kuta area which is one of the famous tourist attractions in Bali. With a journey of about 3 hours drive from Kuta Beach, you will arrive at Lovina Beach. If you come from the direction of Ngurah Rai International Airport, the distance is around 95 kilometers with the duration of the trip approximately 3-4 hours drive. The route of Lovina Beach is quite easy to reach. At the entrance there is a dolphin monument and the inscription of Pantai Lovina is quite large. Lovina Beach presents beautiful and enchanting natural scenery. Only on this beach can tourists enjoy directly the attractions of Lovina Dolphin swimming and jumping here and there. You can use a fishing boat rental service if you want to see Lovina dolphins at a closer distance. The main advantages and attractions of tourism on Lovina Beach are the beautiful natural scenery, and only on this beach can visitors see Lovina Dolphins directly and from close range. If you want to see Lovina Dolphins, it’s good to come in the morning, which is at 5 or 6 in the morning. Because, at this hour there are still a lot of Lovina dolphins that appear on the surface of the sea. When it is day or afternoon, dolphins are usually seen only a little, even quite rare. 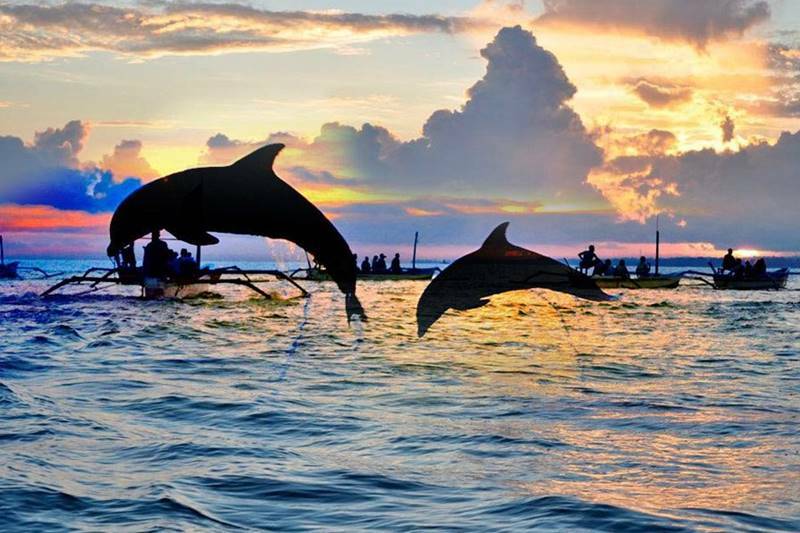 For this reason, it’s a good idea to plan your trip first to see dolphins in Lovina. We advise you to take the Bali round trip tour package described on this website. Please learn it first. To witness the exoticism of Lovina Dolphins that swim on the surface directly from close range, you can rent a boat or fishing boat that is widely offered around Lovina Beach. The rental price is quite varied, starting from Rp. 100,000 per person. You can rent a boat for 2 hours. The price includes a float and welcome drink after you are satisfied to watch Lovina Dolphin in the middle of the sea. Especially for those of you who are planning for dolphin watching at Lovina Beach, please contact us via WhatsApp +62 878 6196 8073 if you want to take a Bali round trip package for 2 days 1 night or private Bali driver to get around to see the exotic of Bali island.